More than 20 advanced students from the University of Toledo’s Concepts in Art, Studio and Theory course will exhibit their work at the annual holiday exhibition – ‘Tis the Secor, Saturday, December 12. The event features work from the community of artists who maintain studio space inside the historic Secor building as well as 30+ vendors offering handmade goods and crafts for holiday shopping at the Market Place area. Live music will fill the air as local bands perform throughout the night. Admission is free. The students’ unique and personal practices explored current and complex issues through a diversity of works ranging from sculpture, photography, design, and ceramics. Spanning the mystical, ideological and political, the exhibition is the culmination of each student’s investigation into both the practice and theory of their chosen subject. The Concepts in Art, Studio and Theory (C.A.S.T.) course prepares studio art majors for their Bachelor of Arts degree through an exploration of what it means to construct a creative and meaningful life as an individual focused on the arts. The course provides an experiential and creative forum that is bound by theories and practices of contemporary art, inspired by visiting artists, and embedded in the Toledo art community. It is in this context that emerging artists hone previously acquired skills and knowledge to create self-directed works of art based on concepts, research, and class critiques. These works of art are at the center of this exhibition. Want to see your design or artwork up in lights? 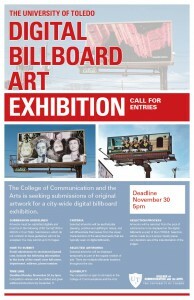 The Art Department is currently calling for entries for electronic billboard display in 2016. The billboards will be displayed in the Toledo area in January and February. All UT student majors in the College of Communication and the Arts are eligible and encouraged to submit an entry. Deadline for submissions is November 30 by 5pm. UT Art Department faculty member, William Whittaker, had his artwork published in the September 2015 edition of Vision Magazine. 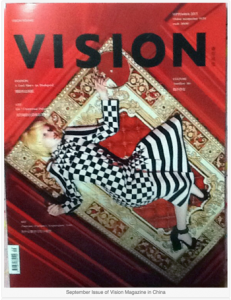 Vision Magazine is a leading art and fashion magazine showcasing the international visual art, fashion and culture to Chinese readers, with its unique visual expression. His published work was from an exhibition project called # TAGGING ART#. This is an art game of crossovers and cross-space. The participating artists from around the world contributed two projects that best presented their work. The curator assigned the works to be anonymously given to other participants, who made new artworks in response to the assigned projects.